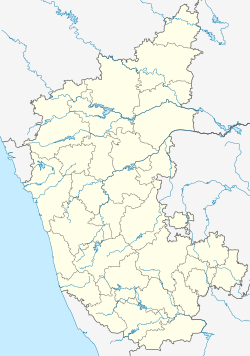 Koodli is a small village in Shimoga District, in the Indian state of Karnataka. Koodli is the place where two rivers, the Tunga River and Bhadra River, meet to give rise to the Tungabhadra River. Koodli is 16 km from Shivamogga, a place where rivers Tunga and Bhadra flow together, hence the name Koodli. It has a smartha monastery stated to have been founded in the 16th century by Jagadguru Narasimha Bharathi Swamigalu of Sringeri. Within the premises of the matha, there are shrines of Sharadamba and Shankaracharya. Outside, there are two temples of Hoysala times dedicated to Rameshwara and Narasimha. Koodali is also known as Varanasi of the south. It is home to Rushyashrama, Brahmeshwara, Narasimha and Rameshwara temples. The 600-year-old mutt of Shankaracharya still stands with inscriptions of Hoysala and Okkeri kings. The place has a historic value, with temples of near Hoysala time. There are shasanas carved near the temples that indicate the era when they were built. The exact dates are disputed, but the sculptures date back to age old Indian culture and look exotic. There are various temples - small and large ones built by the rulers who ruled this place in the age old era. The 12th century Rameshwara Temple is located in the area. There is also a Sri Chintamani Narasimha Swamy Temple beside the Sangameshwara temple. It is believed to be installed and worshipped by Sri Prahlada. The rivers are worshipped and considered to be sacred. A small temple with Nandi denotes the exact point where the two rivers meet, and is considered to be sacred. There are two mutts (schools) in Koodli. One is Shankara mutt (Advaita Philosophy) & the other being Akshobhya Thirtha Mutt (Dvaita Philosophy). There is very old Indian style school of learning for Shankara philosophy, called the Koodli mutt. This has a long history: Once upon a time in the 15th or 16th century, the chief swamy of Shringeri had been on a teerthayaatre, probably to Kashi. He did not return for a long time, which caused the deputy chief to take up the chief's position. But the chief was alive and did return to Sringeri after a few days. But he of course could not go in to the mutt where his own pupil was the chief, so he left Sringeri and started his own mutt at the sangama of Tunga and Bhadra, Koodli and this came to be known as Koodli Sringeri Mutt. Now in the beginning of the 1900s, a new swami took the position of the chief swamy here. He was formerly the teacher of his highness Krishnaraja Wodeyar the 4th, Maharaja of Mysore. This brought good times to this mutt again. Between the original founder and this person, a few talented persons had been chiefs here which made this place keep up the standards. After independence, one particular person was very talented and influential and made the mutt a noted place again. The Mutt was established by Sri Akshobhya Thirtha (a prominent disciple of Sri Madhvacharya) around the 13th or 14th century. The mutt has a rich tradition and is famed for its knowledge of Sanskrit & Madhvacharya's philosophy. There have been three peetadhipathis till date. The current peetadhipathi is H.H. Sri Raghuvijaya Thirta. Sangama - a small Hari Hara temple at the exact point where the two rivers meet. The place is situated about 16 km away from Shivamogga town and is accessible by road. The nearest village is Holehonnur which is around 3 km from here. Wikimedia Commons has media related to Koodli.